I recently shared an article about different ways pretty patterned papers, like scrapbook paper and others, can be used for craft projects. A few of them were home décor crafts but there are still so many things you can do with them, especially for home decorating. Using pretty paper to update furniture and other decorative pieces can really help give things a fresh new look. A few other things you can do is use it to decorate candles, create beautiful wreaths, chandeliers and lots of other decorative items. Scrapbook paper is wonderful, but I know what you may be thinking. Price-wise, it can be really expensive but not always. If you need just a sheet or two you can buy them by the sheet usually for about .25 a piece. Look for sales and you can use 40 and 50% coupons at craft stores. You can get a whole book of beautiful paper for sometimes half the price. Something else you can do is print free patterned papers off the Internet and just print what you need at the time. Just be sure to seal any paper you print from an inkjet first with something like Mod Podge, to avoid runny ink. I am looking into getting a laser printer myself. I hear the ink is sealed when you use those. 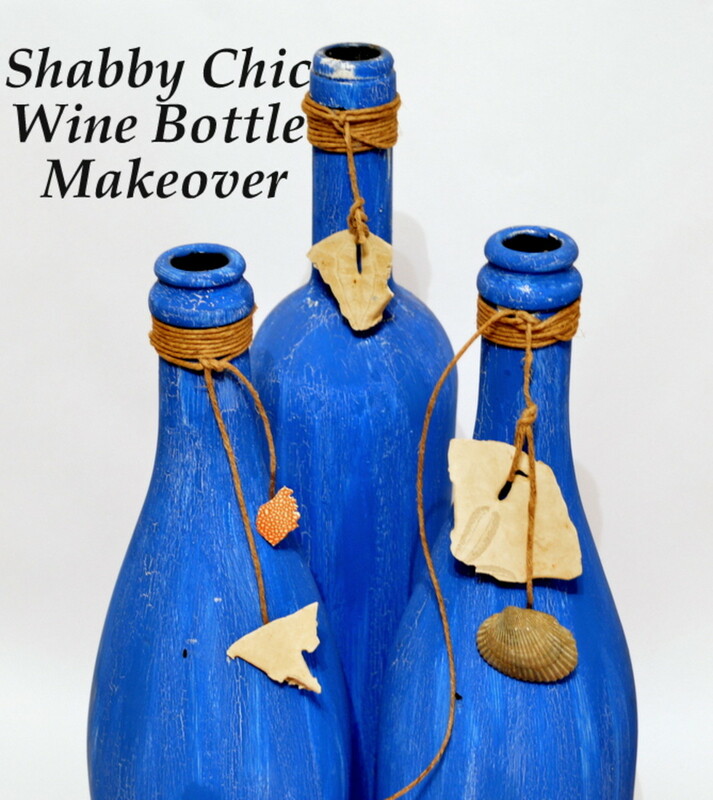 You will see Mod Podge mentioned a lot in this article. Just in case you don't know, Mod Podge is basically like white glue but with a gel-like consistency. 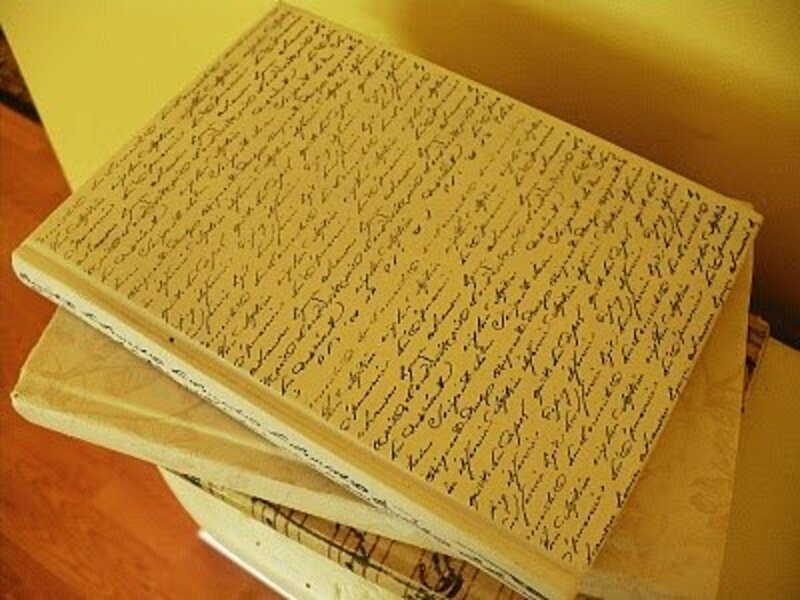 It will not only glue paper down but you can brush it over the top of the paper and use it as a sealer. It comes in matte and glossy finish and dries super fast and crystal clear. This stuff is amazing. 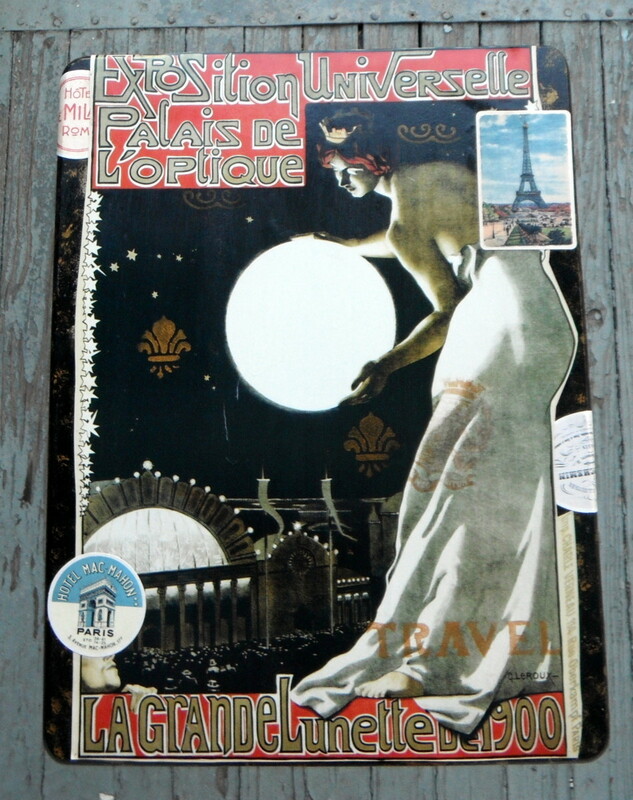 The first one is a gorgeous piece of wall art that I found at Jessica's Musings. 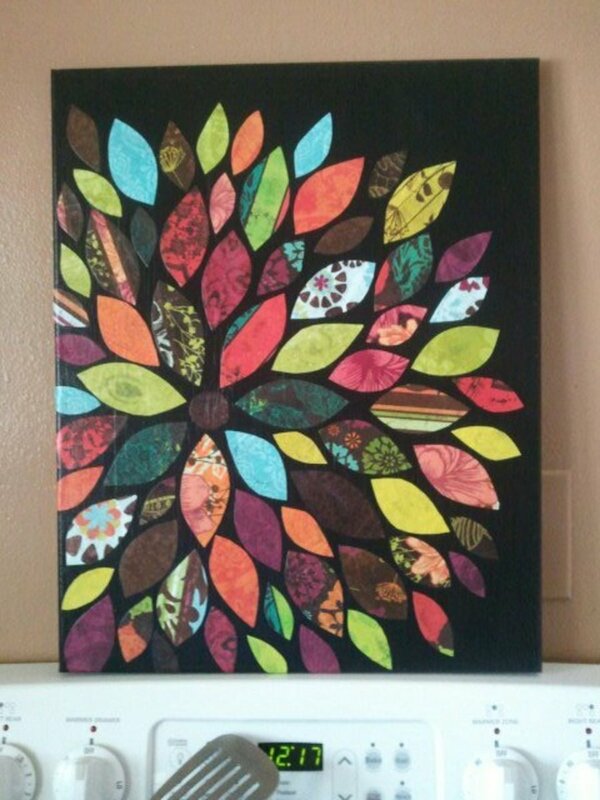 It was made with a canvas that was painted black with pretty scrapbook paper cut in the shapes of leaves. I just love it. It's such a bright pop of color for a wall. What is really neat about it is I can easily see many ways you could personalize something like this to fit your own colors and décor. Over at Ali Edwards, I found the pretty framed butterfly art in the second photo. 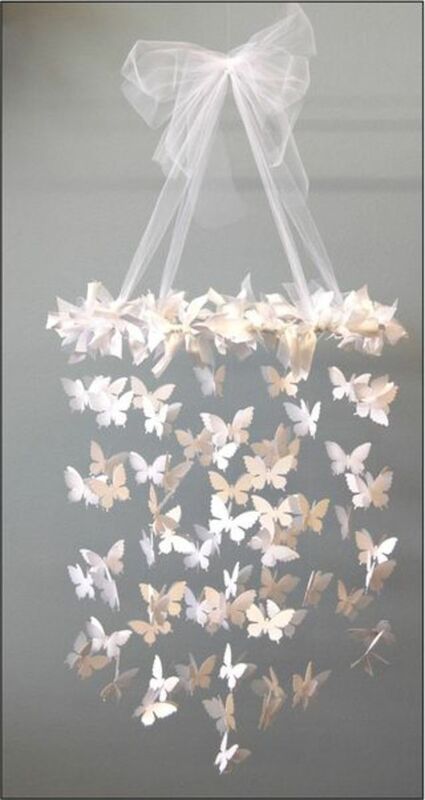 This was made using butterflies cut from paper using a paper punch. I have seen similar projects. One was a Valentine's decoration that was made pretty much the same way except hearts were mounted inside the frame. You could make this type of framed art out of any paper punch shape out there. The possibilities are endless! Queen of Diy made the fabulous group of wall art you see in the third photo and she shares a great tutorial with wonderful illustrative photos showing how you can make this for yourself from 12x12 scrapbook paper sheets and foam board! This is one of my all-time favorite projects out of all the things I have seen done with scrapbook papers. 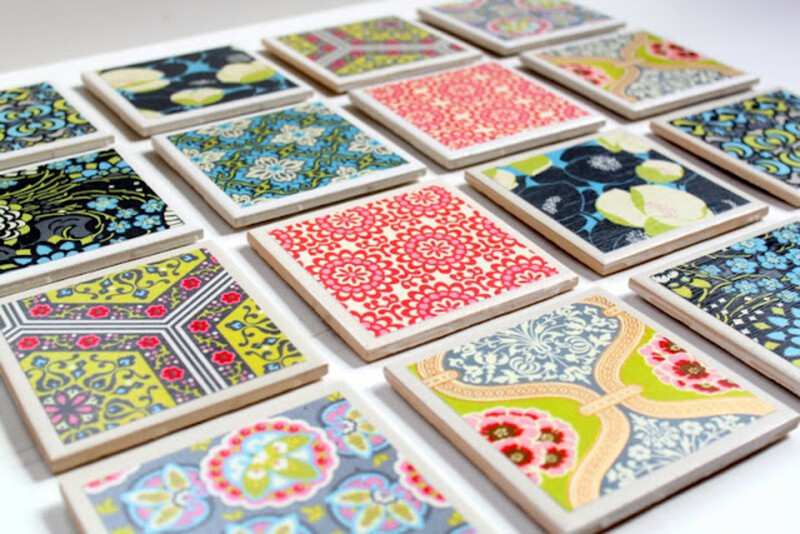 I love these square tile coasters along with the tutorial I found at The Cottage Home. Square tiles of this size are inexpensive and can be found at any home improvement store. 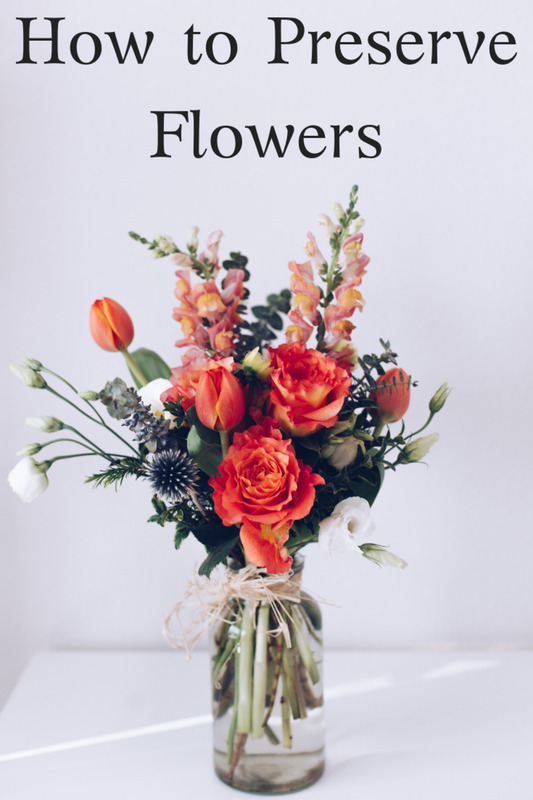 As beautiful as these are, you won't believe how easy they are to make and wouldn't these make a great gift?! 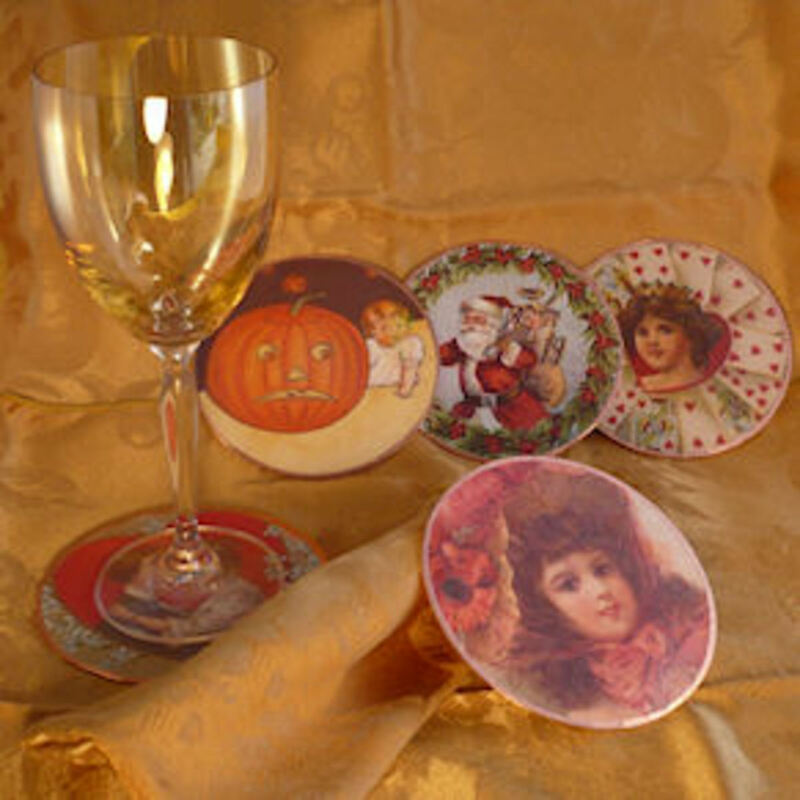 Vintage Image Craft has the tutorial for these lovely round coasters made from old CD's. I love this idea and you really can't go wrong. You can use pretty vintage images like in the tutorial or you can use bright modern colors. The possibilities are truly endless! Pretty papered covered books make beautiful decorative accents on bookshelves, tables, etc. I love these that I found at A Cultivated Nest. The books are first covered with pretty scrapbook paper and then stamped with rubber stamps. It is a beautiful effect and I know they would look beautiful stacked just about anywhere. Have a look at these amazing bar stools I found at Abernathy Crafts. Who knew that bar stools could look this fabulous? 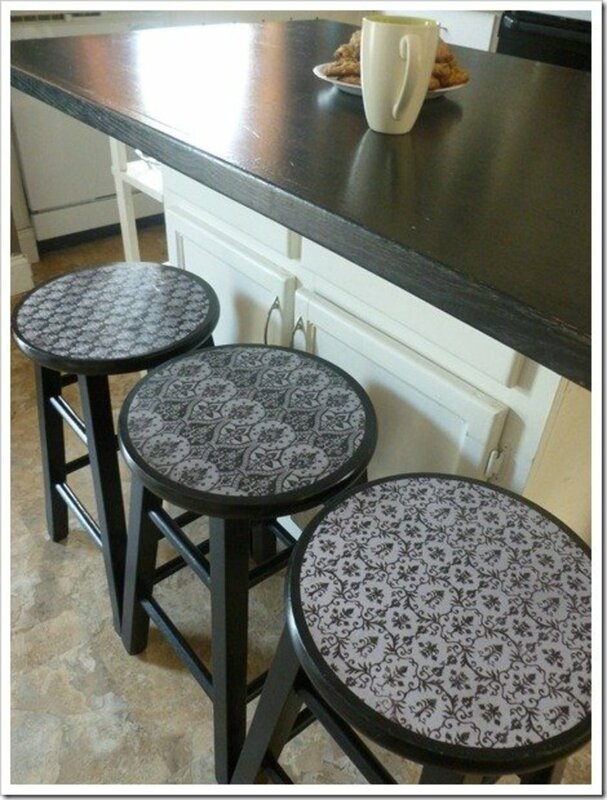 These were actually old bar stools that got a makeover and I must say she did a wonderful job with them. I also found these cute decoupaged chairs at Mitzi's Collectibles. 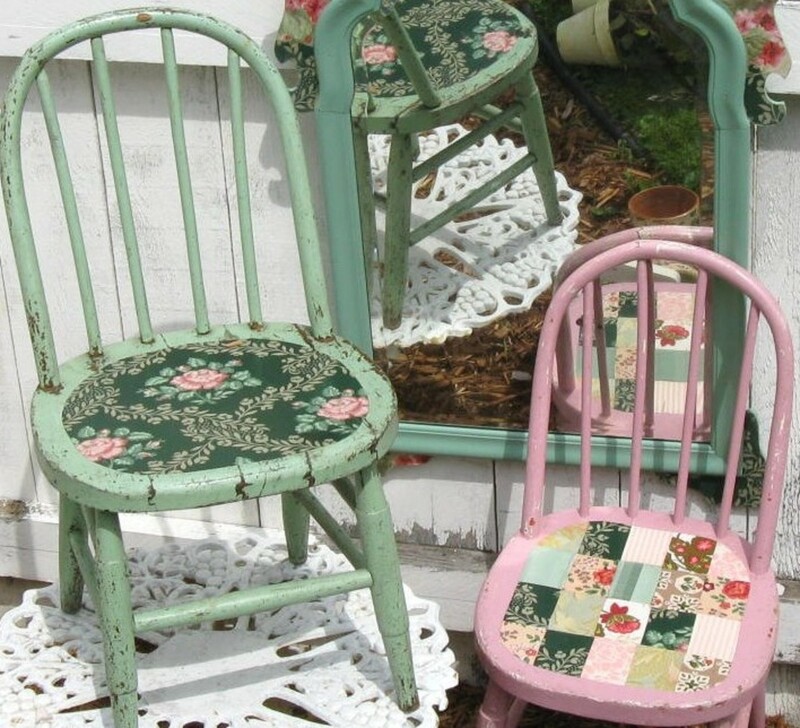 These chairs are adorable, especially the pink one with the patchwork seat. She actually used vintage wallpapers for these (which is darling!) but any kind of paper would work. I love the "shabby chic" style of these chairs. So cute! I am very excited about these DIY dry erase boards I found over at Sister See Sister Do. This is such a neat idea! 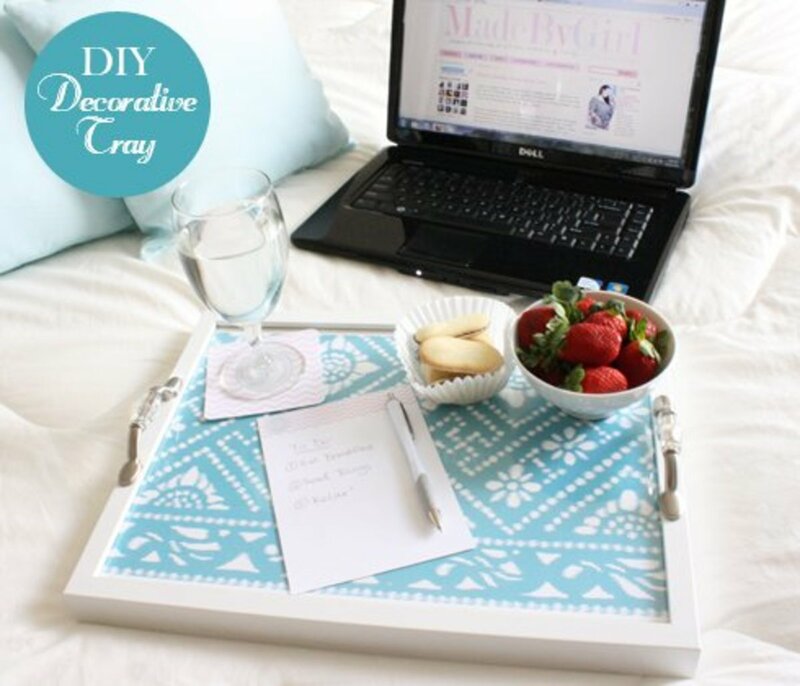 She turns a regular picture frame into a very cute dry erase board by adding paper, photos, etc. mounted inside the frame as a background. I love this cabinet makeover I found over at Modern Jane. The interior was lined with black and white patterned scrapbook paper and I just really love how it pops when the cabinet doors are open. I think this was a fabulous choice. To me it has a simple look, yet elegant at the same time. 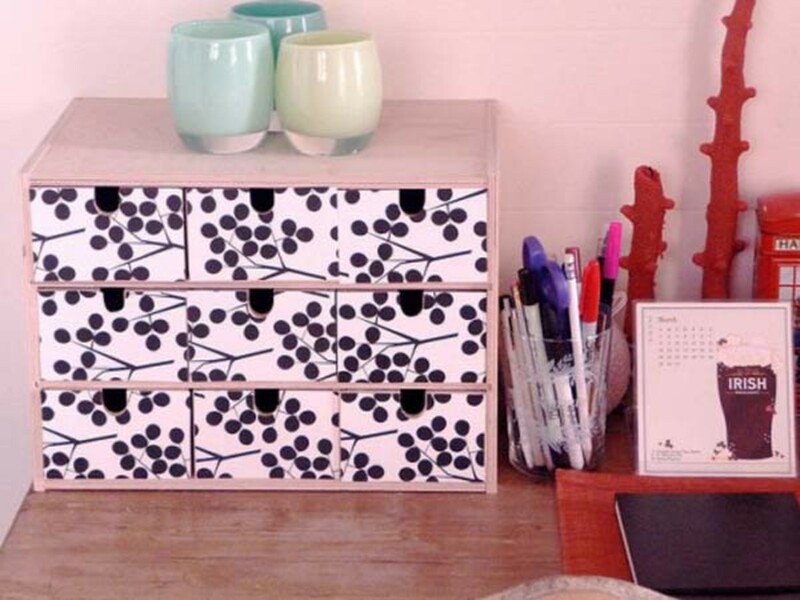 Over at Interiorholic I found this cute wooden IKEA organizer that got a new face using some black and white patterned paper. I'm a sucker for black and white patterns and this one is no exception. Just like with the cabinets above, the contrast of black and white paper really makes this pop. These stackable suitcases are super cute! I found them at The Vintage Umbrella and they were made by mod podging squares and rectangles cut from scrapbook papers onto them. This would be a great project for your pretty paper scraps. Suitcases, especially vintage ones, are used for much more than just travel these days. People love to decorate them and use them for storage, since they stack so well. 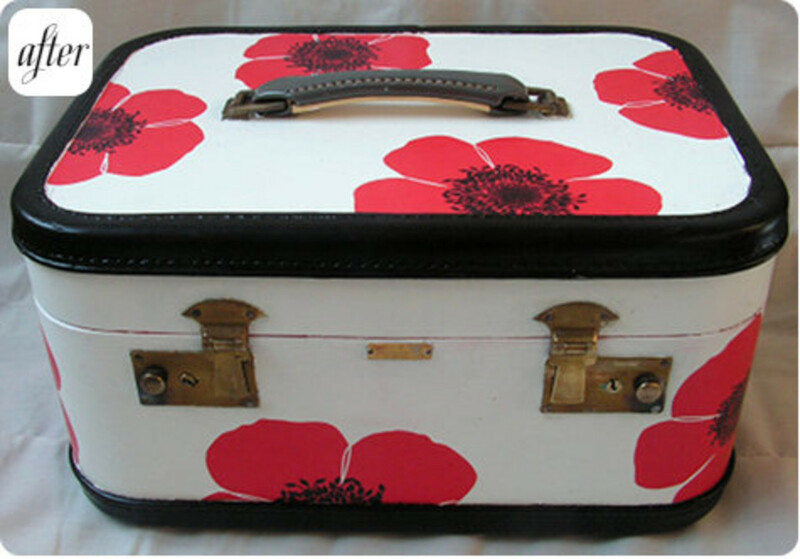 In the second photo is a small vintage suitcase makeover that I found at Design Sponge. It was covered with pretty wrapping paper. I love the big red flowers! 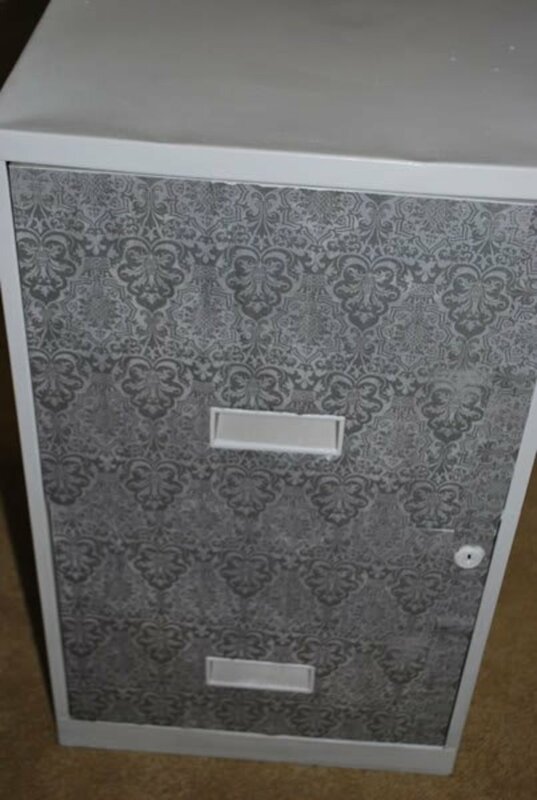 Do you have an old file cabinet sitting around that is just an eyesore? Why not give it a new look like this one I found over at Faith's Place? 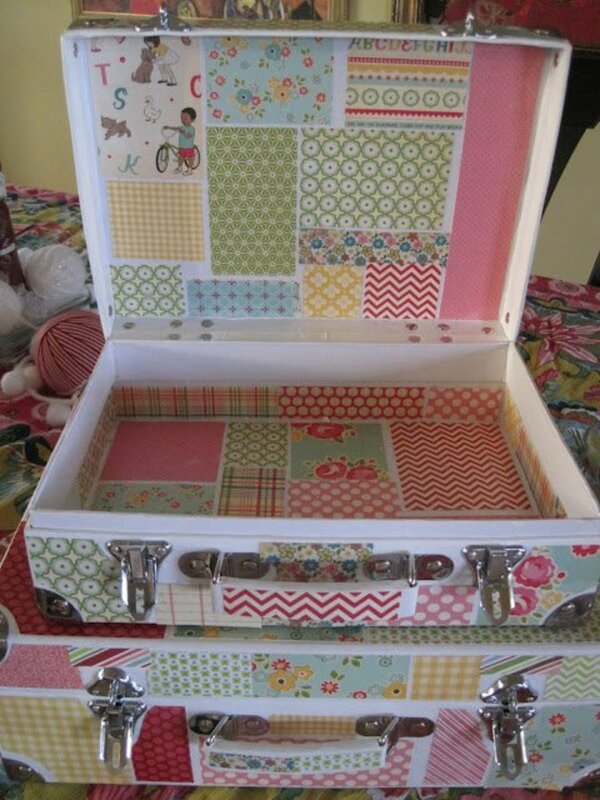 She simply took some Mod Podge and glued some pretty scrapbook papers on to the front of the drawers. I think it looks amazing and it sounds like it was so easy to do. These balls that I found at DCWV Diary (along with a video tutorial!) remind me of those decorative twine balls. I think they are very cute. 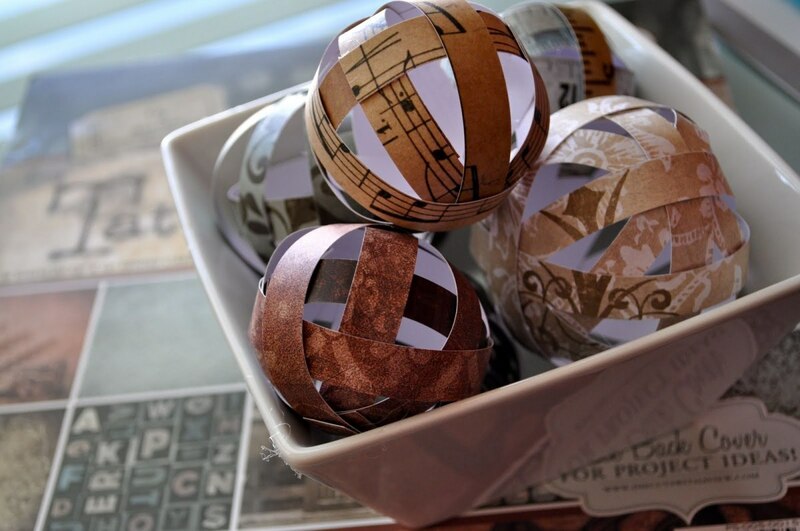 All you need is a glue gun and some paper and they are really just so, so simple to make. 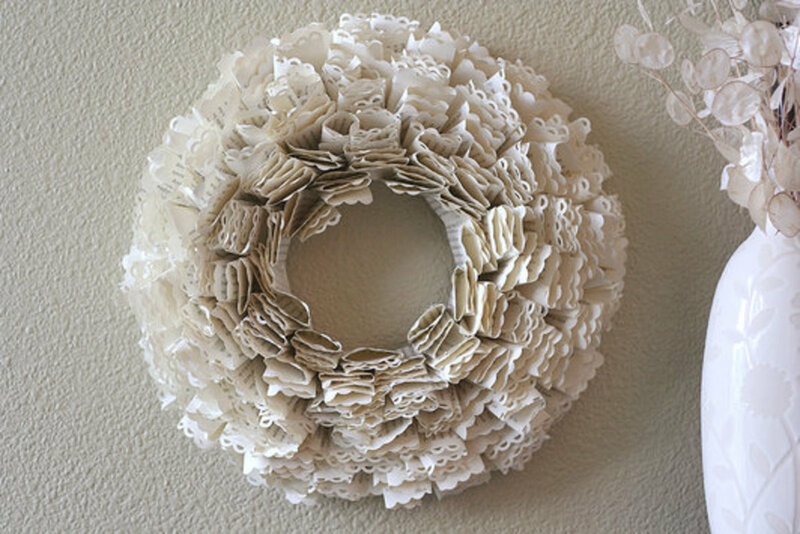 This is a nice wreath made from paper that I found at Fiskars project gallery. I love that it sort of looks fluffy and also that the ends of the paper is punched with a decorative punch. It makes it look like lace. It was actually made from book pages but you could use any type of paper. I think this paper shade is my favorite project out of everything here. 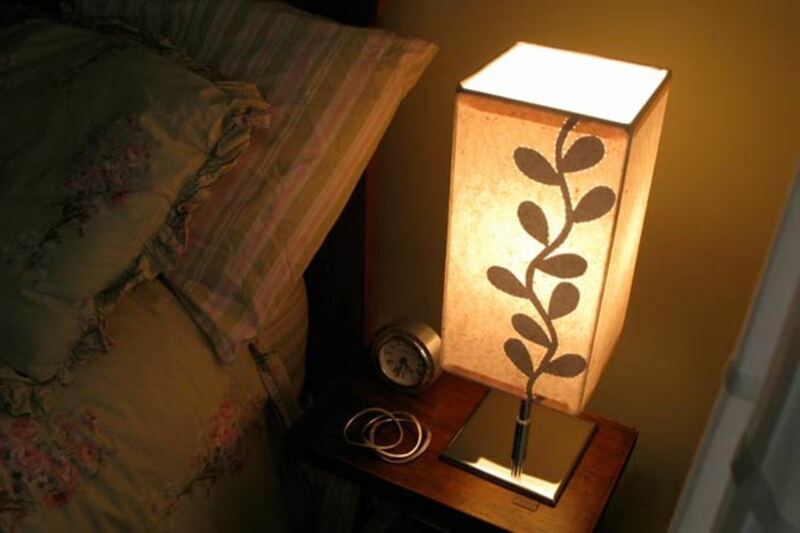 I LOVE how there is a hidden element inside the shade that only shows when the lamp is on and the small punched holes. I think the natural brown color of the paper is very nice but I also think any paper would look stunning, though you may not be able to see the hidden motif as well if it's too dark of a pattern. If you are interested, Shelterpop has shared a fabulous, photo illustrated tutorial. What can I say about this chandelier? There are no words! It's absolutely precious. It is made with white cardstock and vellum. 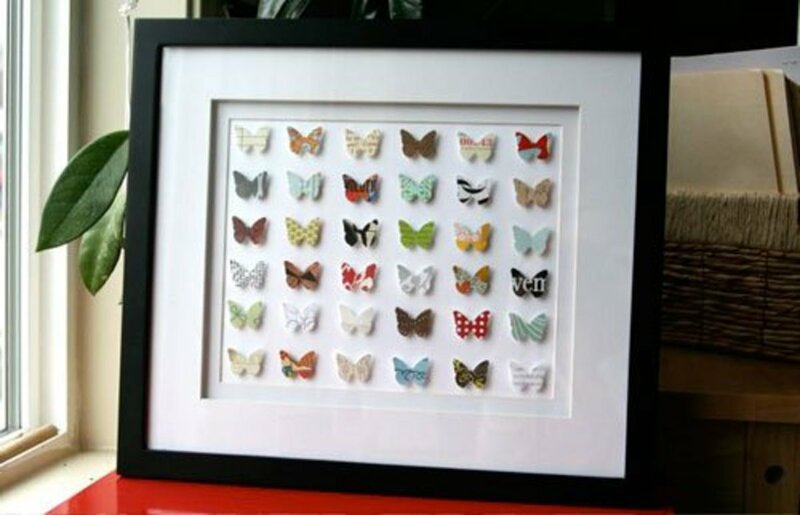 You can use a die cutting machine or paper punch for the butterflies. I think this would be very pretty in a girl's nursery or maybe out on a screen patio and most definitely would make a beautiful wedding decoration. I keep thinking this could look even more magical (if that is possible!) if you could somehow have some small fairy lights intertwined around the hoop and maybe hanging with the butterflies. I know they do have small battery operated LED's now. You could probably buy them with a white cord and they would blend in so well you wouldn't even see them. This is one of those that you could very easily change up to suit your tastes, like using different colors or using a different punched shape. This is an amazing project. To learn more and see a nice tutorial go to Heartland Paper. Give an old clock a new life by changing its face . . . sort of like this one I found at Wonderful Joy Ahead. She bought a plain inexpensive clock at Walmart for a few bucks but it was the perfect canvas and she improved it drastically just by covering the face with pretty paper and adding some new numbers but you could do the same with any old clock you have. I think this is such a great idea. 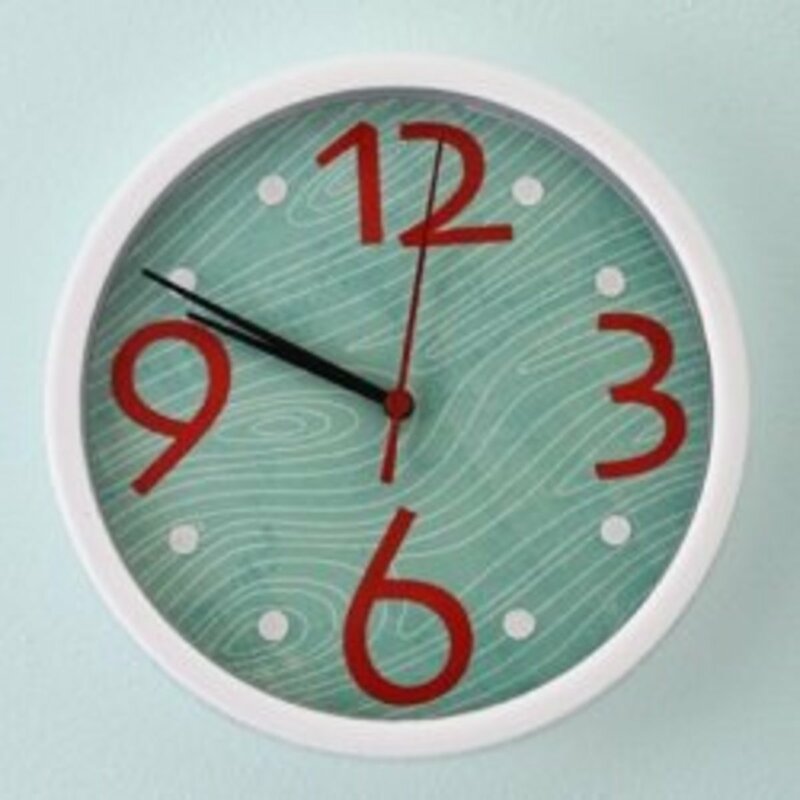 It is a great way to match your clock with your other décor. I would have never thought of it. 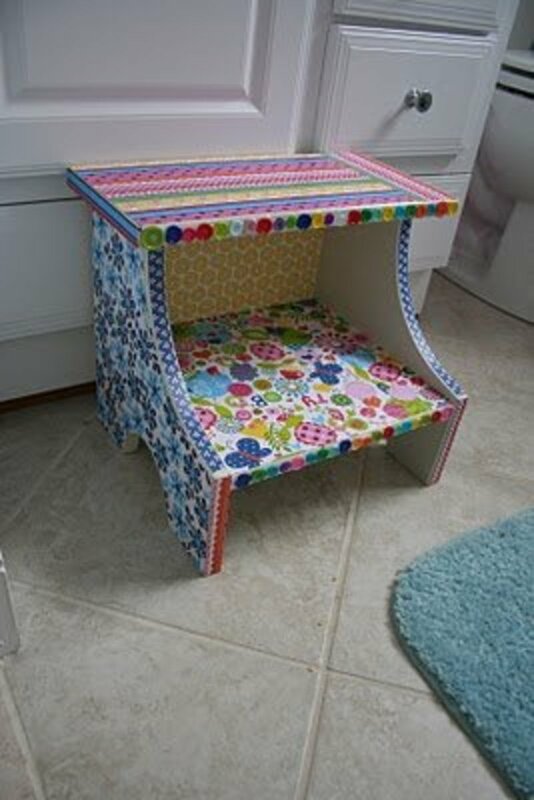 Look at this bright and pretty step stool I found at Pink and Green Mama. I love the colors on this stool. It's so fun!! She used Mod Podge to attach the scrapbook paper and it really is just gorgeous! Something she mentioned in her post is that she used outdoor Mod Podge because it's waterproof and I think that was an excellent idea. You may want to keep this in mind if you will be Mod Podging furniture in the future. 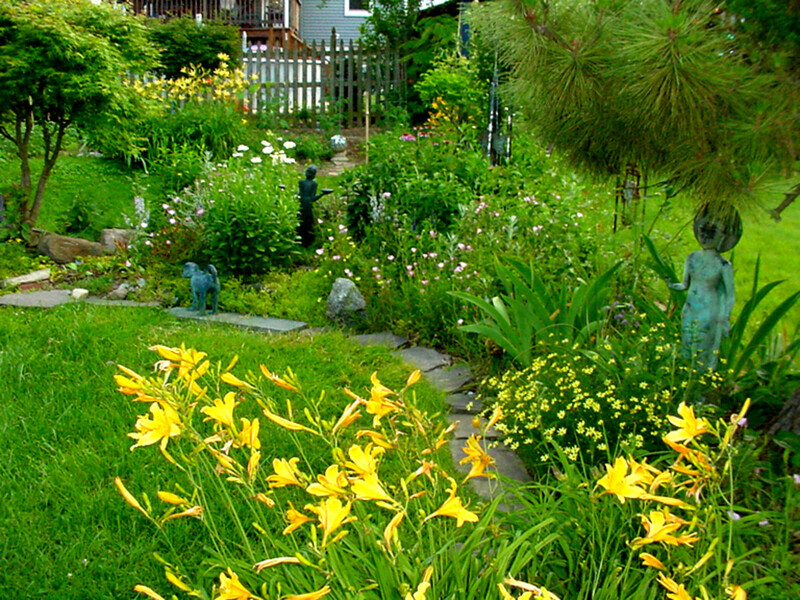 Using the outdoor Mod Podge may be the best choice for your project, especially if it will be in an area prone to getting wet. Hearts are my favorite shape and I couldn't help but share this precious heart shaped stool I found at Two Girls Being Crafty. This one also is covered with a pretty scrapbook paper using Mod Podge. She also sprayed a clear sealer over the top of the stool for added protection. 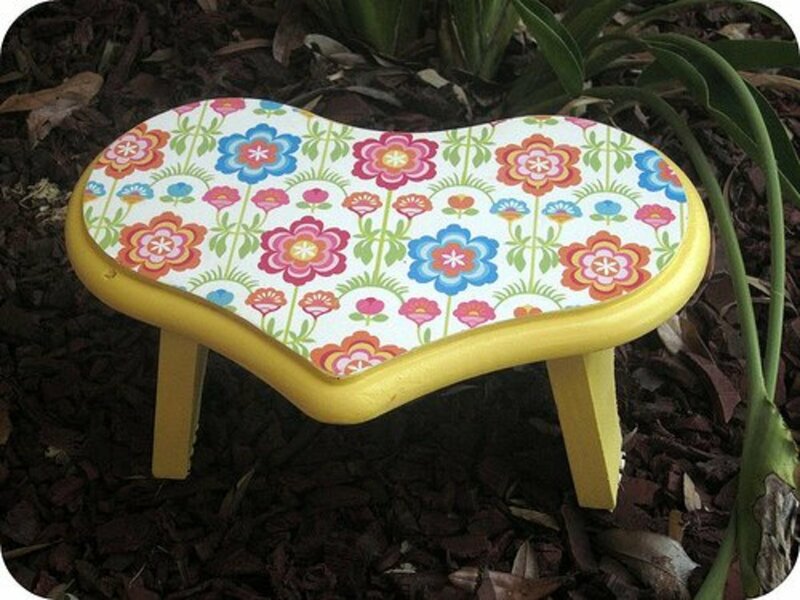 This stool is so cute. I just love it! I swore off scales a long time ago but this project I found at Yearning to Create is very tempting! I have never seen a bathroom scale makeover, but what an awesome idea! 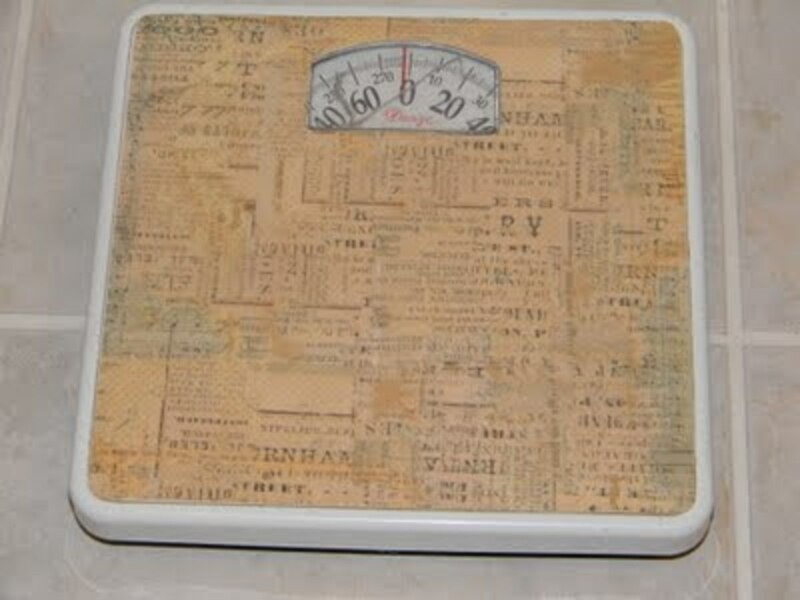 This is a great way to update an old scale that still works great or to match your scale with your current décor. I love the paper that she used. The scale has a whole new look. Another way you can use paper to decorate your home is to cover your outlet covers with paper in colors and patterns that match your décor. Like this outlet cover I found over at Boospire . . . For Women! This is just one of many things they did in bedroom makeover and I think it looks fabulous! 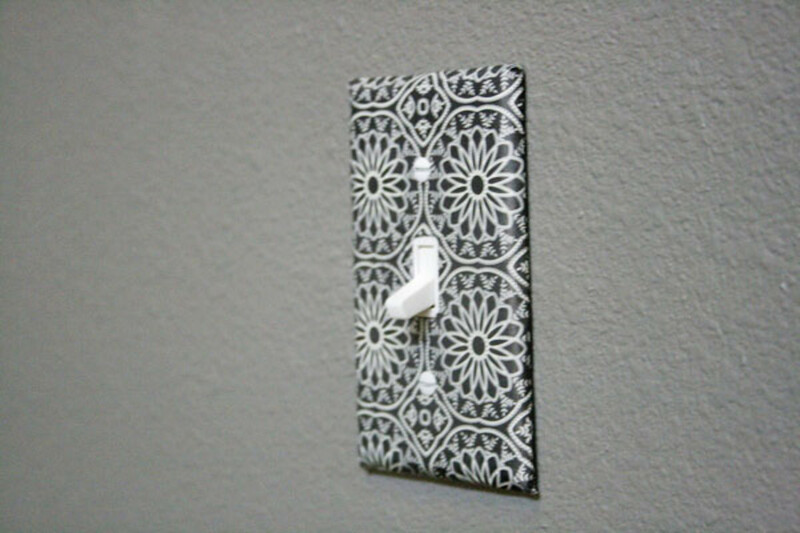 Here is a pretty paper covered light switch plate that I found at Jones Design Company along with a nice, photo illustrated tutorial showing how it was done. I think that pattern really pops and it looks very nice mounted on the wall. 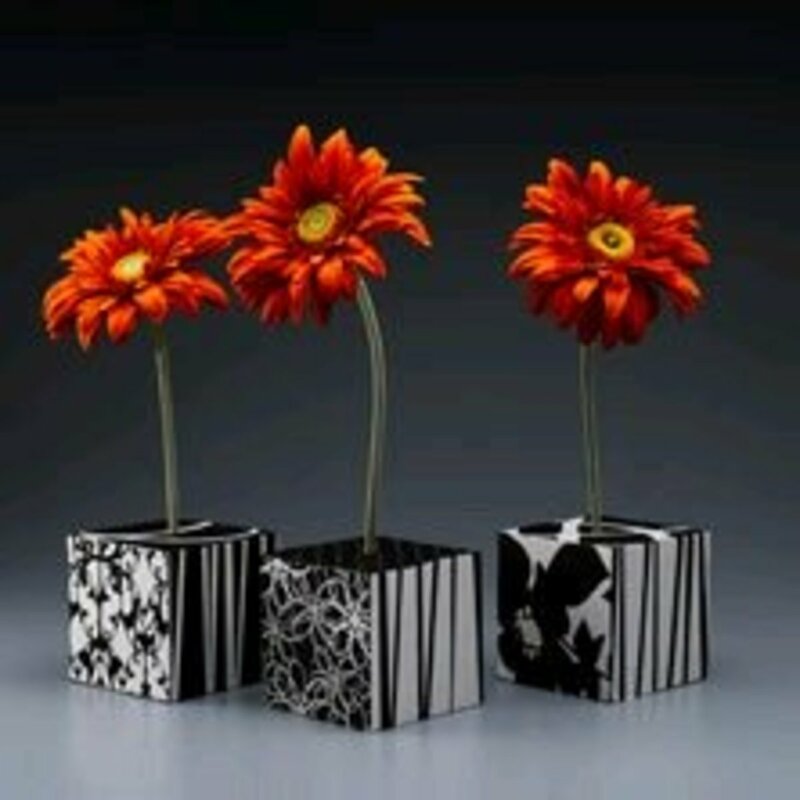 These flower cubes at Favecrafts make a cute decorative touch to any space. Make your own by covering a Styrofoam block with paper squares in the color and pattern of your choice. 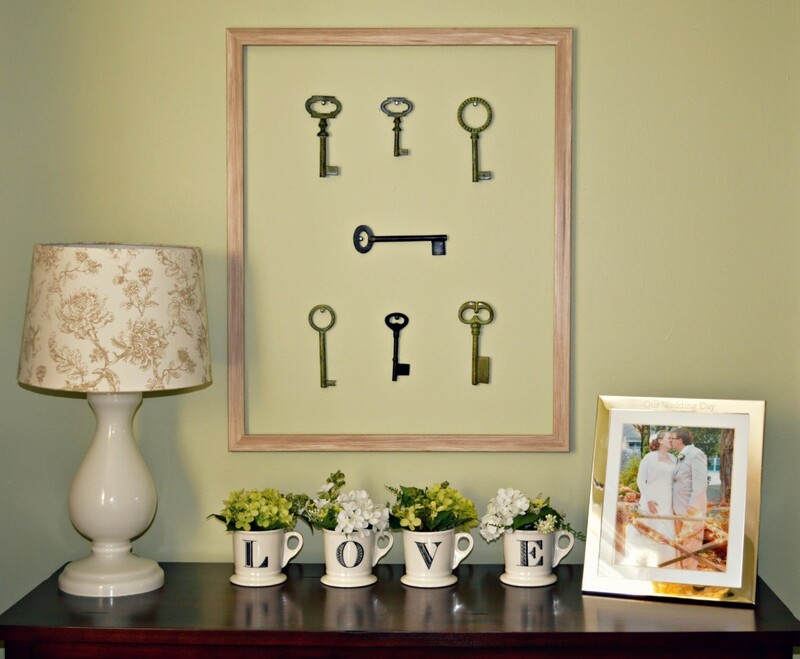 These can easily be customized to match your existing decor. 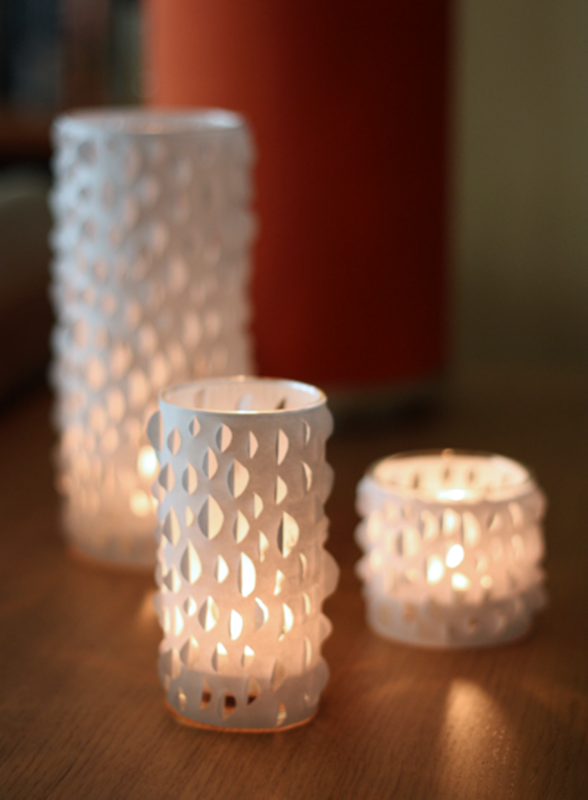 How About Orange shows how to make these neat cut-paper candle holders. What I love about this one is that it really doesn't matter what paper you use, you will still see the candle shining through. This is genius! Some paper may be too heavy to see the candle through it but if you do it this way, you could use paper you want and still see the candlelight. I love the textured look that the paper gives to the candle and these candles look great covered with plain white paper. If you are looking to cover something that is large with paper but just do not have enough paper that you would like to cover it with, use wrapping paper. It comes in a stunning selection of prints, colors and styles and will do the job beautifully. The best way to do it is to use something like Mod Podge to glue it onto the surface and then do a few coats over the top to seal it and help protect it. Regular Mod Podge is wonderful and provides a lot of protection to your projects, but for even more protection, especially for things in the kitchen or bathroom that will be around a lot of water, outdoor Mod Podge would be even better OR you could spray on a clear sealer. Don't forget tissue paper and crepe paper. Those can be used to decorate things too. I hope that you have enjoyed this article and have found these ideas interesting and useful for you. Hopefully you are feeling inspired to use some pretty paper for decorating around your home. Just remember to keep any eye out for sales and don't forget to use coupons. Half off craft store coupons can really make a difference. You can go right to their website and print one off or get one in the Sunday paper. Happy home decorating with pretty papers! Thank you for all your help, I'm in the U.K. And wondering if I can buy Hodge Podge here? Thank you Kristen Howe...I appreciate it! I love all of these crafty and nifty ideas, Jamie. Voted up for awesome and two thumbs up! These are great ideas! Now I know what to do with all my leftover scrapbooking paper from creating my wedding album! Thank you! RTalloni- Thank you so much! Yes, I'm in love with those step stools... the possibilities are just mind boggling with all the different looks of decorative paper available. These are some great ideas for brightening up rooms and I'm keeping those step stools in mind! liesl5858- You are so welcome! Thanks so much for the kind words :) I really appreciate you dropping by! Thank you for sharing your wonderful creations and ideas. Great hub Jamie Brock. Starstream- Thank you so much for adding this to your article! starstream- You are welcome:) Love hearing that this has inspired you! L.L. Woodard- Thank you for the votes up and for sharing! Glad you enjoyed this.. and I agree... it's hard to figure out where to start! Thank you so much... glad you enjoyed it! Neat ideas! I love the stools and the dry erase board idea! You offered so many wonderful ideas in this one article that I decided to add it to my Where to Find Vintage article. These are beautiful craft ideas. My first impression of your main photo was that it consisted of pieces of gem stones. Now, I would be interested in trying this in a small painting mosaic format. Thanks. I love decorating with paper! I've made a dry erase board, recovered a table, and decorated clothespins with scrapbook paper before. There are just too many cool decorative papers in the world and I don't scrapbook, so I have to use them somehow. Great hub; voted up and Shared. What an awesome hub, thank you for sharing so many ideas and images. Very nice collection. Happy I found it! Just came across this hub - wonderful ideas! I will refer back to this one again and again since there are so many clever ideas I have never seen before. Green Art- Thanks for dropping by.. I'm glad you enjoyed the hub! Love these ideas! Especially the wreath and butterfly chandelier!!! Thanks for sharing! This is a wonderful assortment of ideas. I will be coming back to this hub on a rainy day. By Lori- Thank you! That is very sweet of you to say :) I am glad you enjoyed the hub! You are a natural designer ! Really neat. storybeader (Deb)- Thank you for stopping by to read my hub.. 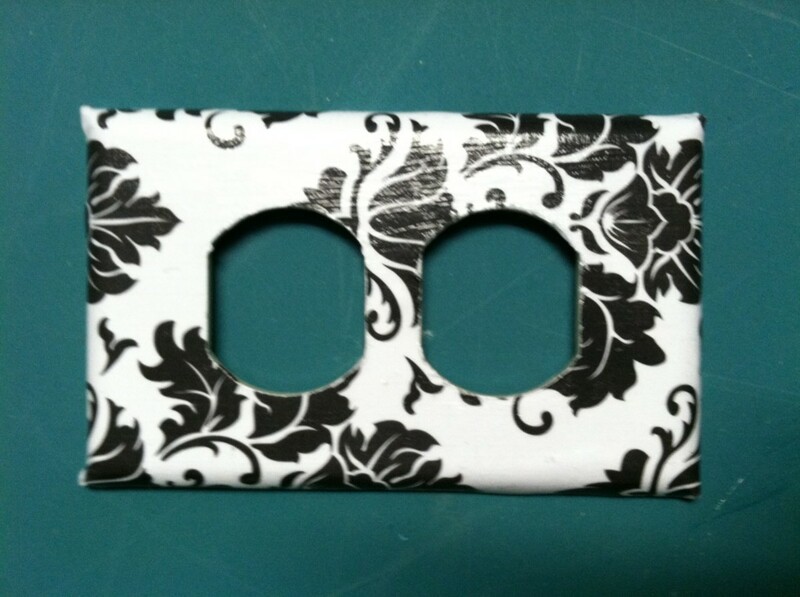 I recently learned there are actually several different types of Mod Podge... even a glow in the dark one! I appreciate your comment.. thanks for dropping by! RTalloni- Glad you like these.. Wasn't that cabinet interior gorgeous?! I would have never thought to do something like that but it really is such a beautiful touch. 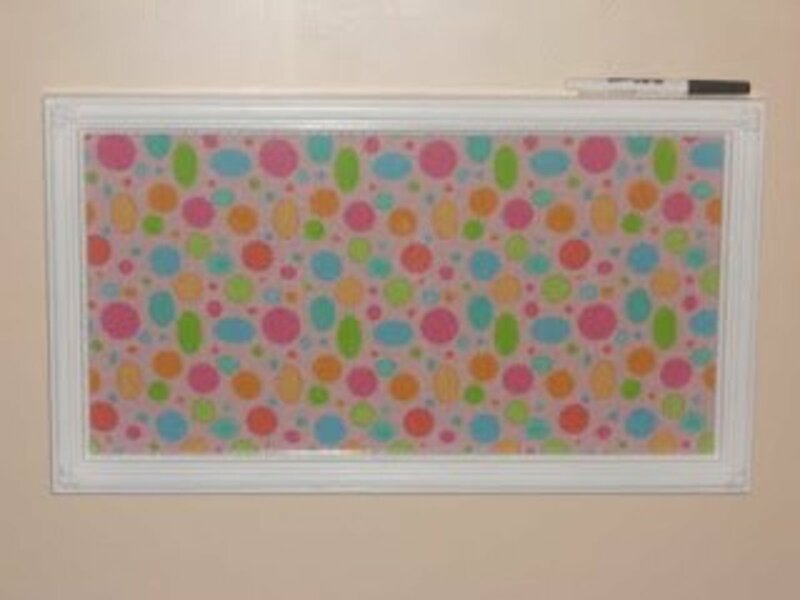 Whether you decide to paint or paper your hutch, have fun with it! 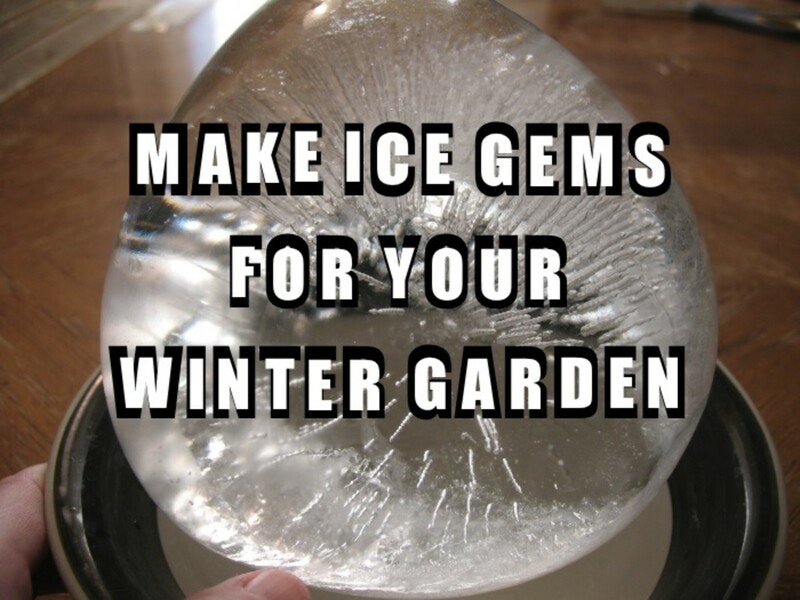 Great ideas, great tips. I was thinking of painting the interior walls of a small hutch but now am going to think again! I always look at that beautiful paper and wonder what to do with it, not being a scrapbooker. Thanks for the great ideas - these ideas are so cool. Voted up and tweeted! I used to cover switch plates with pretty napkins but I like this paper better. Crystal Tatum- Thank you :) Isn't pretty paper and Mod Podge the best?! You can do so many things with it. So glad you liked the hub, thank you for the vote up and for sharing. I have seen the heart punch ones too.. I think any punch would look great and what a great idea for Christmas gifts! Thank you so much for the vote up! Awesome hub! I'm going to refer back to this. I've already done the coasters and since discovering the joys of scrapbook paper and mod podge, I'm interested to see what else I can do. You've given me some great ideas. Voted up and sharing. What an AWESOME hub! So many wonderful ideas, you have put much work into this so great job! Love the suitcases, candles, lamp and light switch . . . all are brilliant. Voted up and more and sharing on! Definitely bookmarking this great piece! So many great ideas there, I actually plan on something similar to the butterfly cut out picture as some christmas gifts but using a heart punch. Love so many of them though so will have to keep it in mind when I need some more inspiration! Thanks voted up and shared! Wow whoever knew you could do some much with decorative paper! Awesome hub! Silwen- I haven't made any yet myself but they look very easy and I'm sure a set of them would look wonderful in your office. Thanks so much for stopping by! bettynj- I love that chandelier too.. Give it a try, I bet it turns out very pretty :) Thank you for stopping by! I like the paper chandelier. I want to try a beautiful one. Great ideas for decorating home. I especially liked those nice coasters. I should make them for my office. They really look wonderful. Awesome job as always, Jamie! 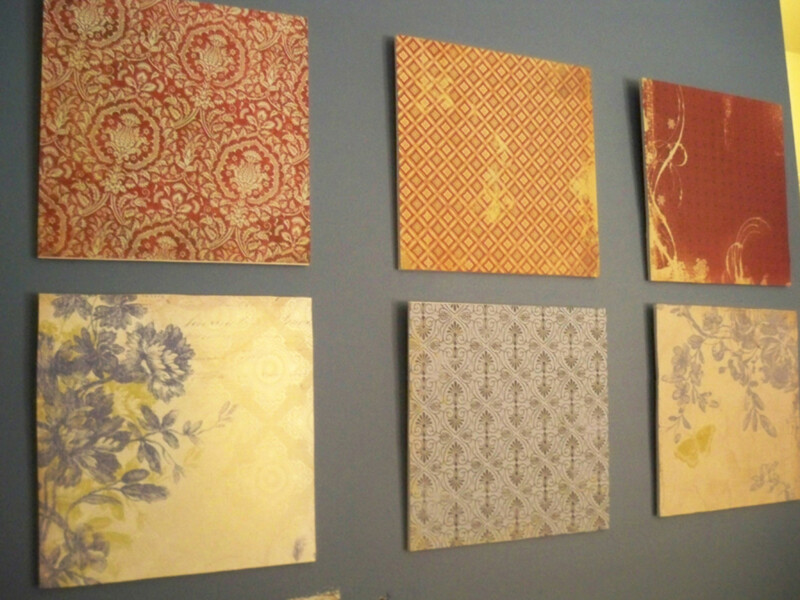 It is really amazing how many different ways you can use decorative paper around the home. Thanks for linking my scrapbook paper article. kashmir- It always brings a smile to my face when I see your cute profile pic in my comments :) Thank you for the vote up and everything! I'm glad you enjoyed the hub. tirelesstraveler- I love those bar stools too, I think they turned out great. Contact shelf paper is great too for stuff like this! A while back I bought some chalkboard contact paper and LOVE it. Hi Jamie great and very useful ideas within this well written hub. These are 20 great home décor ideas ! Vote up and more !!! Oh my, I used Mod Podge years ago for decorating. I love the bar stool idea. The file cabinet I refaced I used contact shelf paper. Great ideas. laptopfinger- Thank you for dropping by.. I'm not sure about having to get a whole new shelf but I do think paper covers add a bit of a decorative touch to the shelf. Having just books on the shelf without covers is fine too.. you could always add some little nick knacks here and there. Hi Sunny, I know what you mean, it's Unfathomable (LOL is that even a word?) all the different colors and designs. It is truly a candy store for paper crafters! I have a few tablets but I could use another 100 or so ;0) Thank you for dropping by.. its always great to see you. rebeccamealey - Yay, I'm so glad that you like them and feel inspired to do your own! That was one of my favorites out of all of them. I love the paper she used. Thank you for dropping by! It's true, using decorative paper covers on bookshelves is a way to bring back the lure, by making it a focal point, of books and magazines as a sign of an organization. 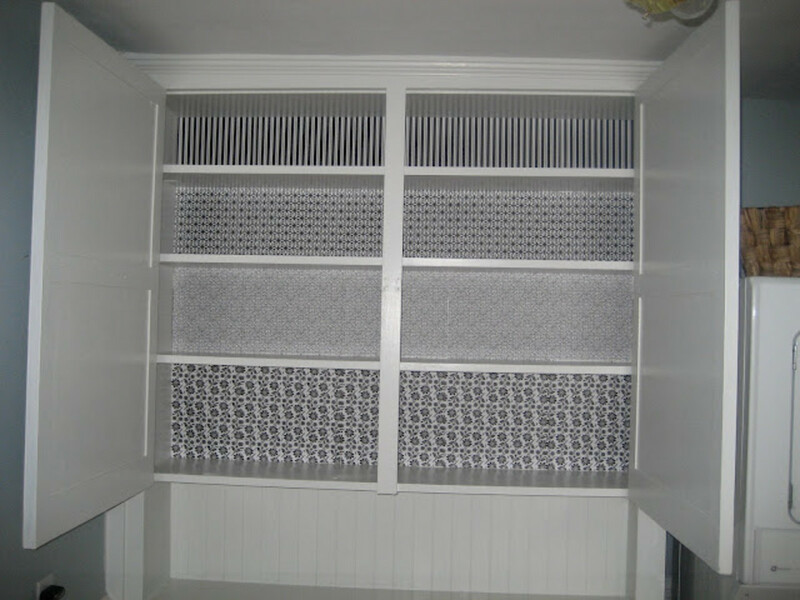 Without the decorative paper, you would have to take down your shelve and get another, which is expensive for many. I've been building up my paper collection! I love when the paper stacks go on sale at Joann's. Great quality and cute designs...thanks for the tips and inspirations...you know I especially love the butterfly ones! Sharkye11- You are welcome, I'm glad you liked some of these ideas... I agree about the scales, I had never even thought about revamping a set of scales but they look great! I love the dry erase boards too.. doing them out of picture frames and using the glass as the board is such an awesome idea! Thanks so much for dropping by! I just love these ideas. Creative and very cool, I am thinking seriously about doing my bar stools like this. Thanks so much! SO cool. Lots of great ideas here. voting up and sharing! Wow! These are some really great ideas. The bathroom scales actually look nice. Who would think scales could be pretty? Love the dry erase board idea too! Definitely trying that ASAP! Thanks for sharing!